Well neither did I really. Here is a short story. Chris Record is one of the top internet marketers in the world. His product “Dark Post Profits 2.0” took the Internet Marketing world by storm as it launched. So I decided he is one of the guys I am going to listen to and learn from. If you listened to the podcast then you will know he promoted an idea called “Cash In On Your Passion”. Would you like to “Cash In On Your Passion”? Would you like to be blogging about what you love and are passionate about and getting paid to do so? No matter what you are passionate about you can “Cash in On Your Passion” by creating a blog, a mailing list, and selling products and services that are highly related to your passion to other people just like you. So…would you like to “Cash in On Your Passion”? Well? What you need to get started is a Blog, a squeeze page, and an autoresponder. You can get a one month freebie web site at JV Zoo Webhosting. I use these guys. They are great! 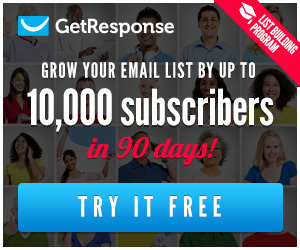 You can get a one month freebie autoresponder from Get Response. I use these guys too. They are great! Here is a short video about what Get Response is able to do for you. And if you are not interested in making money online? Why are you reading my Internet Marketing blog? LOL! Previous articleMay the Force Be With You! Next articleCash in On Someone Elses Passion!